TEMPE, Ariz. (AP) Mike Trout says he is only concentrating on one thing regarding his future - the upcoming season. The Los Angeles Angels star said he is happy for Bryce Harper, who has agreed to a $330 million, 13-year contract with the Philadelphia Phillies , but that he hasn't considered how Harper's deal will set the stage for his own negotiations. Trout can become a free agent after the 2020 season. He is owed $33.25 million in each of the next two seasons, completing a $144.5 million, six-year contract. "I haven't even thought about it," Trout told reporters before a spring training game Friday against the Kansas City Royals. "Obviously, you guys bring it up a lot and I appreciate you asking me all these questions, but right now is not the time to think about it. I still have a couple more years." Angels owner Arte Moreno reiterated last month at the start of spring training that re-signing Trout is at the top of the franchise's list. "One of the last interviews I gave, I said it's not in the back of our mind but in the front of our minds," Moreno said. "I think it also depends a little bit upon the agent and the player. It's not like it's just us." Trout is a two-time American League MVP who has finished in the top two in voting six of the past seven years. He led the majors last season in on-base percentage (.460) while hitting .312 with 39 home runs and 79 RBIs. 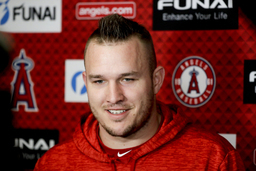 Trout, who said he called Harper to congratulate him on the contract, mentioned that he also followed the recent deals involving Nolan Arenado and Manny Machado. Arenado agreed to an eight-year, $260 million deal with the Colorado Rockies while the San Diego Padres signed Machado to a $300 million, 10-year deal earlier in spring training. "It took longer than people expected," Trout said. "You look at the health of the player. The first couple weeks you are not used to that baseball conditioning. But now they are going to be ready for opening day."